alaTest har samlet og analyseret 23 anmeldelser fra magasiner og hjemmesider. Mange kan virkelig godt lide skærmen. Også kvaliteten imponerer, men anmeldere er mindre positive med hensyn til pålideligheden. Excellent array of ports. Long battery life. Pricey. Slightly squashed and shallow keyboard. Intrusive cooling fan. Bottom Line: Dell's 13.3-inch Latitude 7390 business laptop is compact and lightweight, with fine fit and finish, but its steep price magnifies its minor flaws. The Dell Latitude 7390's eighth-generation Intel Core i7 power and excellent battery life propel it to the upper echelon of our favorite 2-in-1 business convertible laptops. Peppy performance. Great battery life. Two Thunderbolt 3/USB-C ports. Fingerprint reader and face-recognition camera. Pricey. A few ounces overweight. Cramped keyboard. Bottom Line: The Dell Latitude 7390's eighth-generation Intel Core i7 power and excellent battery life propel it to the upper echelon of our favorite 2-in-1 business convertible laptops. Dressed in a nice black suit, this business PC is a sound choice for frequent travelers who depend on data privacy. Data protection hardware along with Dell's software and services quickly ratchet the price up. It seems slightly heavy for its size and its keyboard is on the small side. If your primary concern is keeping your data private at all costs while you're in the office or on the road, the Dell Latitude 7390 2-in-1 has you covered. 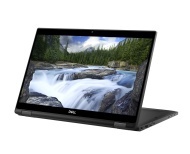 You should consider the Dell Latitude 7390 for strong performance and a long-lasting battery, but its low-travel keyboard and fans that run often should give you pause. The Dell Latitude 7390 2-in-1 has a lovely display, strong performance and long battery life, but it suffers from some usability issues. The Dell Latitude 7390 2-in-1 is a stellar performer but overkill for the regular business user.